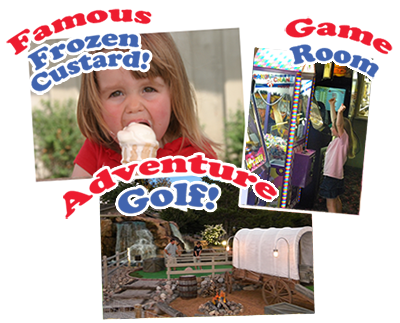 Family Fun Since 1987, Settlers Mill is Northern Wisconsin’s finest 18 hole adventure golf. Settlers Mill continues to top the list of ‘up north’ family traditions. After golfing, treat yourself to a scoop of velvety smooth frozen custard or test your skills in our modern video game room. Serving fresh vanilla, chocolate and a special flavor each day! We are conveniently located 1/2 mile south of the Bridge on Hwy 51 South in Minocqua, WI.